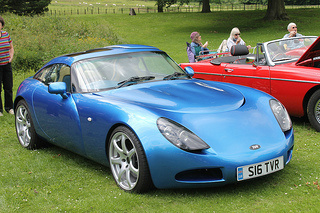 The two seater TVR T350 sports car was launched in 2002, and powered by TVR's own 3.6 litre, inline 6-cylinder, Speed Six engine, with four valves per cylinder, and a hefty compression ratio of 11.8:1. Using a five speed gearbox, it developed 350 bhp at 7200 rpm, and 290 ft/lbs of torque at 5500 rpm, and produced a top speed of 175 mph, a 0-60 mph time of 4.2 secs, and a 0-100 mph time of 9.1 secs. It was offered as either a Targa variant, designated the T350T, or a fixed head coupe, designated the T350C. It used all round coil spring independent suspension, and 12 inch vented disc brakes at the front, and 11.1 inch at the rear. It had power assisted steering, and the body panels were constructed of glass reinforced plastic. The Targa variant had two removable carbon fibre panels at the top, which could be placed in the boot when not in use. The T350 was created as the blueprint for a race car that was to be entered in the new GT Cup class of the British GT Championship, as well as a number of overseas race series. The object was to achieve maximum downforce, whilst keeping drag to a minimum. To achieve this, the smooth front of the car did not contain the usual central radiator air intake. In this way, drag was reduced at the front, whilst the sharply cut off rear section also helped reduce drag at the back. The roof of this fixed head coupe had been designed to slope towards the rear, which ensured that the airflow remained close to the roof, so greatly reducing any tendency for the rear to lift. To further maximise its aerodynamic shape, the T350 was fitted with an air diffuser at the rear, and a splitter at the front. Such aerodynamic gains would, of course, not be possible in the case of a two seater convertible. The inside of the T350 was based very much on that found in the TVR Tamora. With the rear of the car in the form of a hatchback, this created plenty of boot space, together with easy access for loading. The chassis and five speed gearbox used were the same as those featured in the Tamora and Tuscan models. 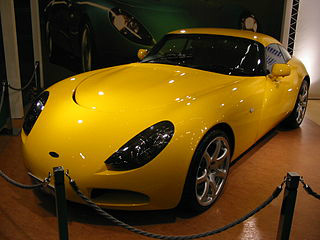 The design of the T350 was used as the basis for that of the TVR Sagaris, a more powerful variant, powered by a Tuscan S or Red Rose Speed Six engine. The T350 sports car was built until production at TVR as a whole ended in late 2006, when a combined total of around 300 of the T350C's and T350T's had been built. The original race car project did not materialise but, in its place, the gritty T350 road car was born. A 2002-06 TVR T350 with high mileage would fetch around £18,000/$29,000, whilst a good example would command within the range £21,000/$33,000 to £30,000/$48,000, with a really outstanding example priced up to £40,000/$64,000.